This Bach Flower Essence brings a return to faith - not only faith in God and the Higher Self, but faith in the meaning of life, and faith in one's own future. At its extreme, this personality doesn't feel comfortable unless it is engaged in worry over something. Interestingly, even when working with Bach Flower Remedies, the Gentian personality will harbour a seed of doubt about their effectiveness - in spite of seeing the positive results. The true Gentian personality will always be a sceptic, but after treatment will become a "Positive sceptic," able to see difficulties without falling into despair, and able to live with conflict because he can once again see a positive outcome at the end. 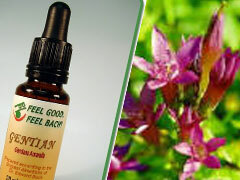 Children who often have trouble in school and wish desperately not to be forced to return are exhibiting the temporary Gentian state - Wise parents should keep Bach Flower Remedies on hand to help them when those situations occur.